Nagasaki University's Research Center for Nuclear Weapons Abolition released its latest report on 13 June 2018, based on information gathered from governments and research institutes around the world. The center estimates there were about 14,450 nuclear warheads worldwide at the beginning of this month. That's down 450 from a year earlier. The center believed Russia and the US had 6,850 and 6,450 warheads. The Center's estimates ignore US and Russian tactical nuclear weapons, and assume the low-end estimated stockpiles of other countries are for the most part in storage. This table is a book-end "worst case" alternative. North Korea, India and Pakistan have all embarked on major expansions of their nuclear weapons production capacities, and by the 2025 timeframe are set to have stockpiles that rival those of France and Britain. To all evidence, Israel continues to produce new nuclear weapons for a growing stockpile. 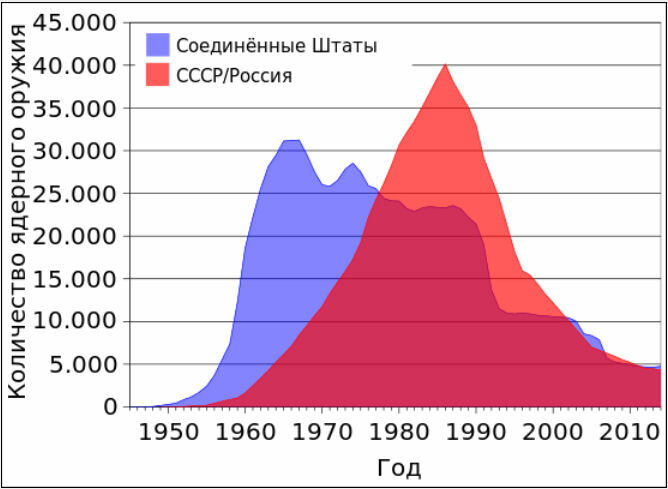 The United States and Russia have effected massive reductions in their nuclear stockpiles relative to Cold War peaks, but further reductions seem stalled, given Russian insistence on maintaining a large prestige stockpile. France has published the size of its stockpile, and the UK continues to reduce its stockpile, both measures recommended by the arms control community. Almost no one noticed, and these initiatives had no impact on other countries. Many public estimates of the stockpiles of Israel, North Korea, India and Pakistan are static, and have not increased since the turn of the century, despite the fact that these countries continue to produce new nuclear weapons. The Chinese arsenal has probably been substantially misunderestimated in recent years, as their force has been transformed from single-warhead liquid fueled missiles to multi-warhead solid fueled missiles. 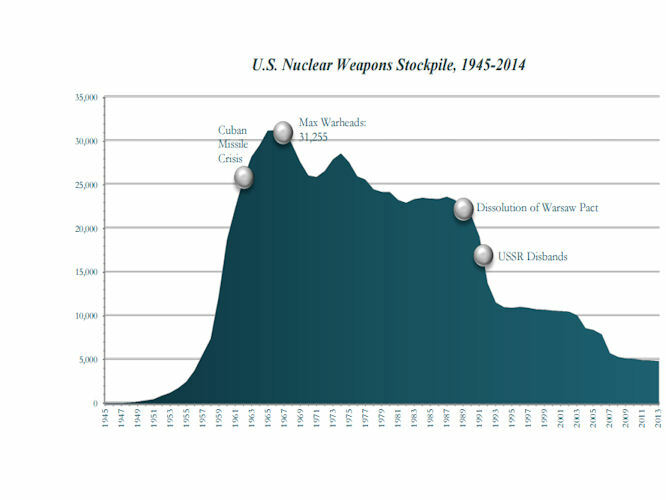 The size of the stockpiles of the smaller nuclear weapons states are poorly characterized in the open literature, and the inventories of delivery systems are very poorly characterized. Japan has a large inventory of Plutonium that could be turned into a fairly sizeable nuclear weapons stockpile on a timescale of a few months. What is to be Done?? Russia opposes further nuclear reduction because it presently has by far the world's largest arsenal of deliverable weapons, and this nuclear superiority is one of the few reasons anyone pays attention to the Russian leadership. United States of America will not reduce its nuclear posture to a level substantially lower than the Russians, even though by some measures the present delieverable posture is not much more than half that of Russia. United Kingdom has taken a variety of unilateral reductions as an example for other countries to follow, but no one noticed, and now they are down to a minimum deterrent posture. France is not going to reduce lower than the UK, and as with Russia, nuclear weapons are a claim to fame. China seems to believe that a few hundred nuclear weapons are one of the keys to being a great power, and maybe many more than just a few hundred would be needed to offset an American missile defense. India is not too sure why it has nuclear weapons, but rivals China and Pakistan have them, so India doesn't want to be left behind. Pakistan has a well founded fear of India's growing conventional superiority, and has embarked on a massive buildup of tactical battlefield nuclear weapons the likes of which has not been seen since the Fulda Gap in Germany during the Cold War. Israel does not want to be shoved into the sea. North Korea saw what happened when Iraq and Libya confronted the United States and did not have nuclear weapons. In June 2016 SIPRI defined "operationally deployed nuclear weapons" as warheads "placed on missiles or located on bases with operational forces". At that time, SIPRI judged that China, India, Pakistan, Israel and North Korea had no operationally deployed nuclear weapons. SIPRI's estimate of "deployed" nuclear weapons for the US and Russia is about half the number typically assesed as "deliverable". In the late 1940s the United Stated initially retained civilian control of nuclear weapons, but the Department of Defense acquired control of the US arsenal after the beginning of the Korean War. More recently, arms control advocates have proposed de-alerting nuclear forces, and storing nuclear weapons separately from their delivery systems. Neither of these rationales would appear applicable to the five countries identified by SIPRI.